Barnie’s CoffeeKitchen calls its pronto! liquid coffee sticks “personal brew coffee,” which sounds much chicer. 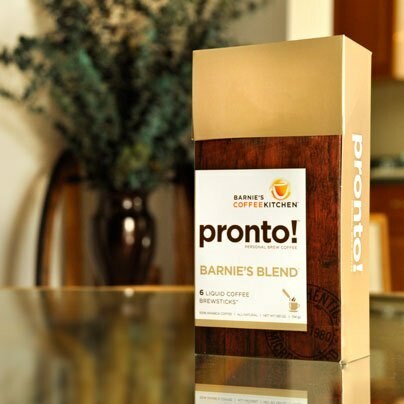 Made from 100 percent South and Central American Arabica beans, the medium-roast Barnie’s Blend is full-flavored and full-bodied, and for an instant coffee, pretty darn delicious. Simply add 10 oz. of hot water to the coffee concentrate, stir and sip. Other available flavors include crème Brulée, Hawaiian Hazenut and Cool Café Blues, but our fave is definitely the basic, balanced Barnie’s Blend. It’s perfect for the office, when brewing an entire pot seems daunting. For the record Pronto is the best invention since sliced bread!! Barnie’s Blend is my fav with Southern Pecan a close second! However you can get it for $5.99 if you buy it directly from Barnie’s online v. Amazon for $8!! !